On Wednesday, April 10, we held our 2019 DifferenceMaker Preliminary Pitch-off at O’Leary Library on South Campus. This year 33 student teams got the opportunity to pitch their ideas to our panels of guest judges. 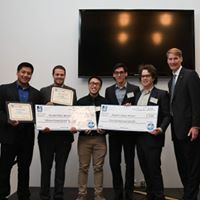 To end our event, the ten finalist teams were announced and will be competing on April 24th in our 2019 Idea Challenge for a chance to win $50,000! Congratulations to our ten finalist teams! Jack Abrams ’74 Kennedy College of Sciences; Lisa Alloca ’87 ’91 Manning School of Business; Janet Benvenuti ’77 ’82 Kennedy College of Sciences; Janet Dellea ’84 Manning School of Business; Susan De Mari ’98 ’00 College of Fine Arts, Humanities, and Social Sciences; Matthew Donahue; Earle Durham; Bill Estes ’87 Francis College of Engineering; Steven Geyster ’83 Francis College of Engineering; John Grayson ’87 Francis College of Engineering; Richard Juknavorian ’98 Zuckerberg College of Health Sciences; Sarah LaLiberte ’06 Manning School of Business; Jay Lang ’00 ’15 College of Education; Brenda Maille ’78 ’78 Kennedy Colleges of Sciences and College of Fine Arts, Humanities, and Social Sciences; Diane Maltais; Glenn Morgan ’86 College of Fine Arts, Humanities, and Social Sciences; Mahati Mukkamala ’09 Manning School of Business; John Norden ’80 College of Fine Arts, Humanities, and Social Sciences; Michael Rider ’87 Francis College of Engineering; Richard Rossetti ’83 Francis College of Engineering; Raymond Southworth ’81 College of Fine Arts, Humanities, and Social Sciences; Andrew Sutherland ’94 Manning School of Business; Chet Szablak; Joseph Vaillancourt ’90 ’01 Manning School of Business; Mark Yates ’80 ’81 Francis College of Engineering; and Bill Yelle ’85 Kennedy College of Sciences. Lastly, we would like to thank our guest speaker, Tyler Cote from Operation250, for sharing his experiences and success since joining the DifferenceMaker Program! Don’t forget to stop by our 2019 $50k Idea Challenge on April 24th from 5:30 p.m. to 8 p.m. in Moloney Hall to see our finalists pitch their ideas! 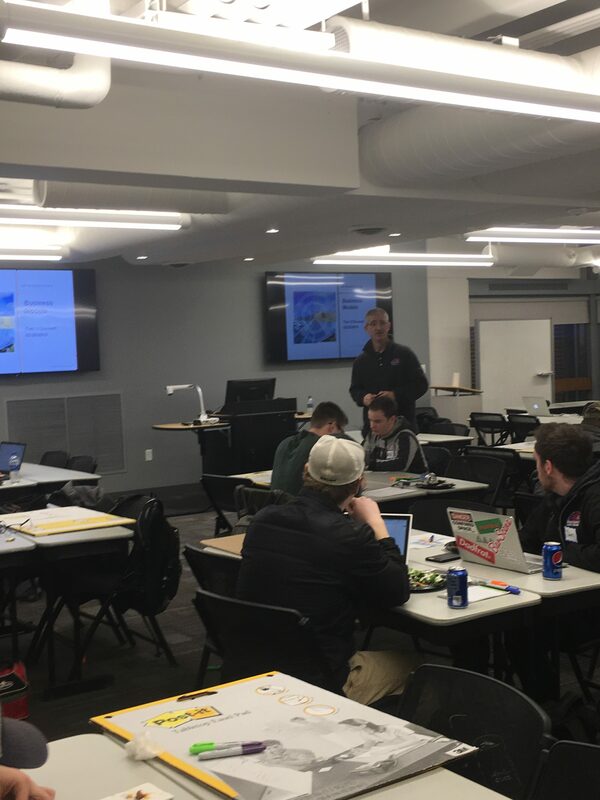 On Monday, February 25th, we held the third part of our Workshop Series, Developing Business Models. As over 45 students arrived, they made their way over to the baked potato bar to serve themselves some delicious baked potatoes with a variety of different toppings. Innovation Initiatives Senior Director, Tom O’Donnell, and Professor Hunter Mack the DifferenceMaker® Faculty Fellow from the Francis College of Engineering, led this workshop. 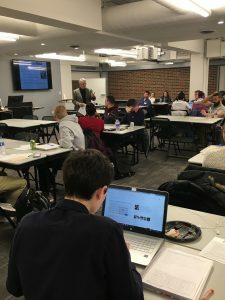 As they helped guide student teams through developing their business models, they often gave examples of companies whose business models failed due to their lack of research in a certain area. To end the night, student teams worked together to develop their own business model by first determining many of the key factors that must be considered before finalizing any business model. Thank you to everyone who joined us and made Workshop 3 our best turnout yet! We hope to see everyone at the final part of our Workshop Series, Delivering Your Rocket Pitch, which will be held Wednesday, February 27th, at 5:30 in Lydon Library room 110! Come hungry – dinner will be served! The second event in our Workshop Series was held Thursday, February 21st, from 5:30PM to 7:30PM in Lydon Library Room 110. This workshop was focused on Assessing Opportunities and Value Proposition. As over 30 students arrived, some delicious fajitas were being served. The night began with Faculty Fellow, Professor Brent Shell, from the Zuckerberg College of Health Sciences, presenting about what “Assessing Opportunities” really means. He stressed to the students that there is a market for practically everything, but the question is if there is an opportunity or a need within that market. To finish of the night, Faculty Fellow, Professor Neil Shortland, from the College of Fine Arts, Humanities and Social Sciences, presented about the importance of value in a product or service provided. Both Professors kept it a very fun and engaging night, often asking questions and opening the floor to DifferenceMaker® student teams to share how their product and service ideas can bring value to the consumer. All workshops will be held in Lydon Library, Room 110, North Campus from 5:30 – 7:30PM! Dinner is served at each workshop, so please come hungry! 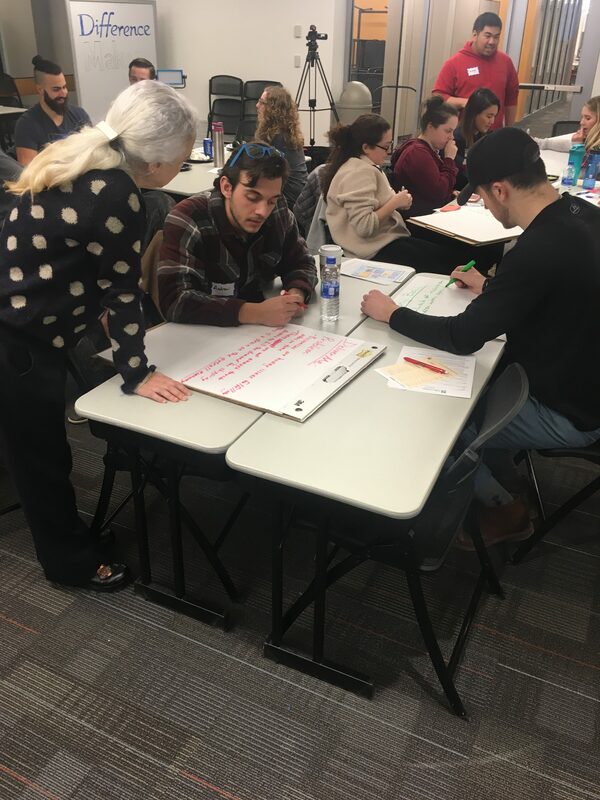 We kicked-off our Workshop Series Tuesday evening, Feb. 19, 2019, in Lydon Library, Room 110 with Identifying Problems! Over 40 students and faculty arrived at 5:30PM to engage in Workshop 1. Fresh salad, pizza, chips and cookies were served. 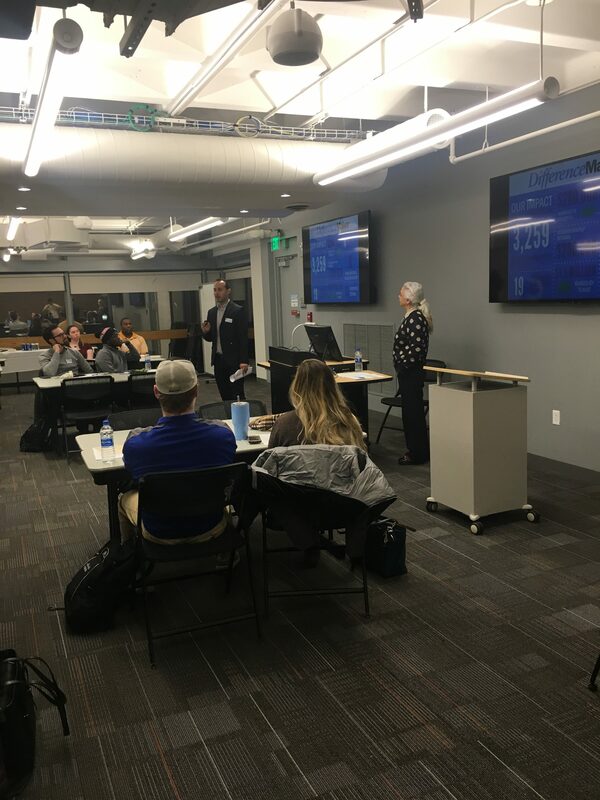 Entrepreneurial Initiatives Program Director, Holly Butler, began the night by introducing our guest speakers and giving a brief overview of the DifferenceMaker Workshop Series. Guest speakers, Professors Iman Chahine and Mazen El Ghaziri, led the workshop and described the questions that needed to be answered in order to identify the significance of each team’s problem. After the presentation, students broke off into new or existing teams to brainstorm problems they were passionate about solving. Students were able to work together and come up with some great problems that needed to be dealt with, ranging from children with disabilities to safe medication disposal systems. 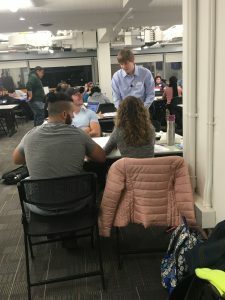 By the end of the night, students had created or joined teams, found out the significance of their problem, and gained an understanding of what steps to take next in order to move on with their projects. We want to thank everyone who came out and shared your amazing ideas with us! Don’t forget to keep working hard to prepare for the $50,000 Idea Challenge! 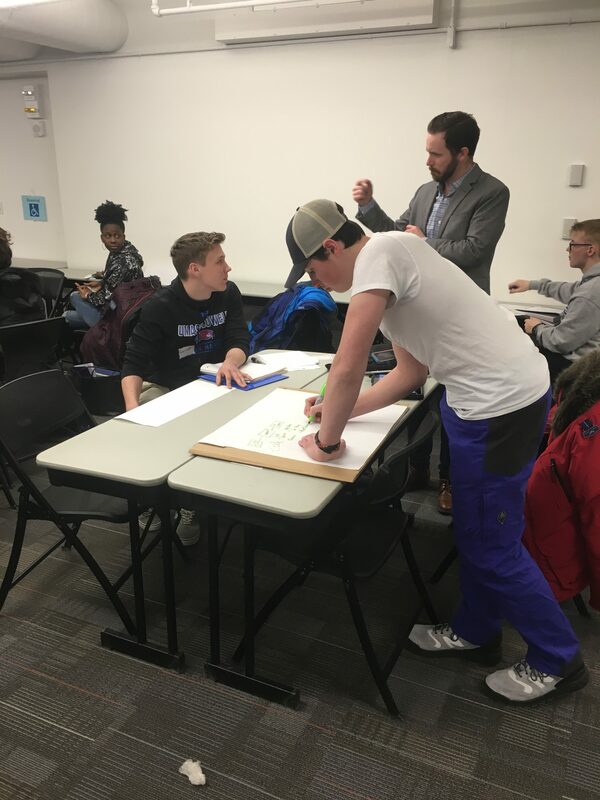 On Wednesday, January 30th, we began our spring semester with the 2019 Idea Challenge Kick-off and Idea Hack! This event was held from 5:30PM to 7PM in the Saab ETIC, Perry Atrium located on North Campus. As the students, professors, and mentors arrived, the night began with a variety of delicious foods and some networking. 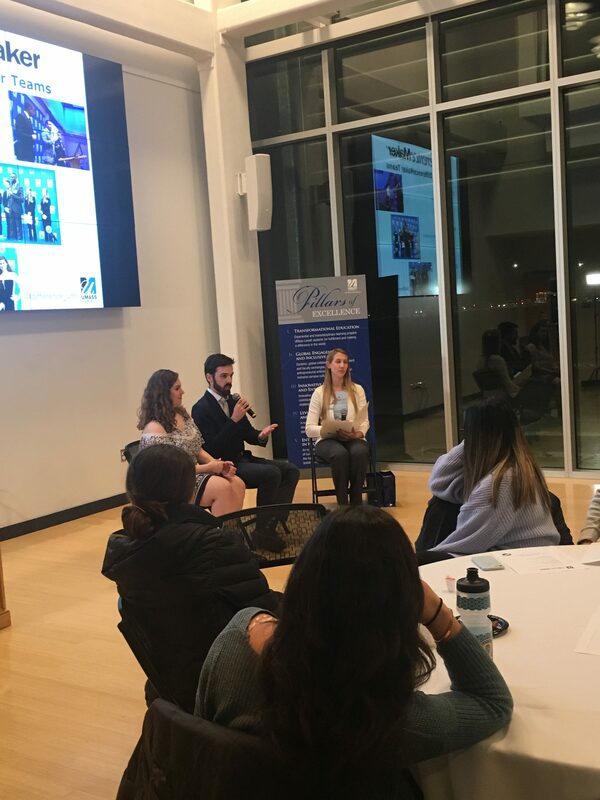 As over 90 students crowded into the atrium, Tom O’Donnell, Senior Director of Innovation Initiatives welcomed the audience by briefly introducing the DifferenceMaker® Program and providing his own experiences. Shortly after, the Entrepreneurial Initiatives Program Director, Holly Butler, interviewed a panel of past DifferenceMaker Teams. 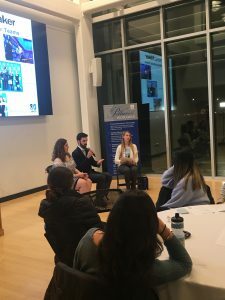 The panel included Kierra Walsh from UML Green Roofs and Tyler Cote from Operation 250. They described their experiences with the DifferenceMaker Program, where it has gotten them today, and answered a few questions from the student audience. To end the night, Ha Pho, Entrepreneurial Initiatives Program Manager led our Idea Hack Activity and Discussion. 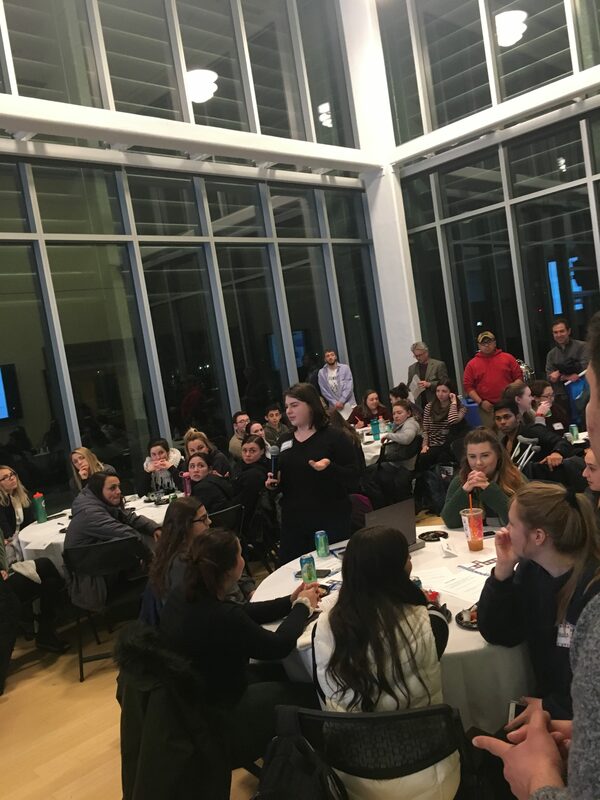 Students stood and explained their ideas for real world problems, involving Health and Wellness, Social Responsibility, and Mobile Applications. Then, others joined teams based on their interests of the ideas. Next, teams brainstormed and added to the ideas. Lastly, they presented their solutions to the audience. On December 6th the Francis College of Engineering Prototyping Competition was held at Perry Atrium in the Saab Center on North Campus. For the first few hours of the contest, teams were set up throughout the lobby of the building, showcasing and explaining their prototypes to the public, as well as the preliminary judges as they filtered in. The preliminary judges selected 5 teams as finalists to pitch their idea in a presentation to the panel of finalist judges. Before the pitches began, Joseph Hartman, Dean of the Francis College of Engineering, introduced the judges, and gave an overview of the format for the contest. Rajia Abdelaziz Rajia Abdelaziz ’16 Francis College of Engineering. 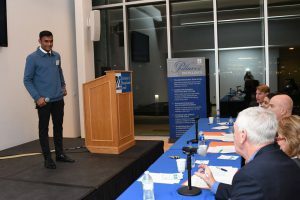 Rajia is the co-founder of invisaWear which won the Francis College of Engineering Prototyping Competition in 2015 and the Innovative Technology Solution prize at the 2016 $50,000 Idea Challenge. 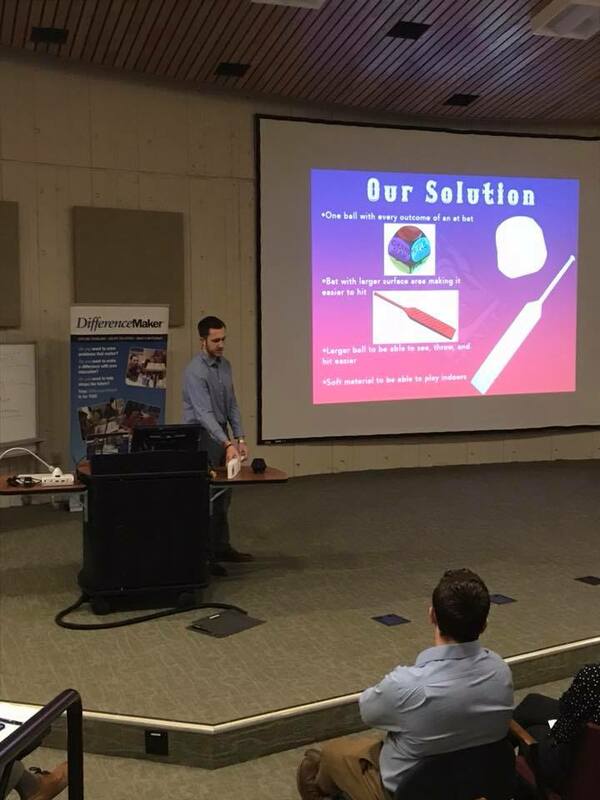 The first team to present was Pyramid pack consisting of Sean Roche, Brett Wadman, and Patrick Drummey Jr. Their idea was to create a weight-distribution backpack that relieved some of the strain that backpacks put on the body. They were followed by Cameron Edmonds of Project SASS. The idea here was an automated satellite and GPS beacon that can call for help from remote locations. 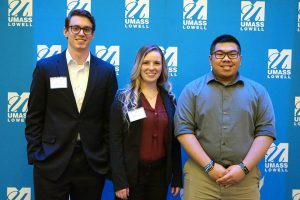 Project SASS was also a winner at the 2018 $50,000 Idea Challenge. Next up was Benjamin McEvoy of Benji Ball, fresh off of his win at the Creative Venture competition the night before. Benji Ball is a game similar to wiffle ball that takes the baserunning out of it, to cater to children with disabilities, as well as make it easier to play in confined space. The next team was yet another group presenting on back to back nights. Air Align also took part in the Creative Venture Competition the night before. This group consisted of Daniel Garfinkel, Alexander Barr, Dennon Audette, Alex Higgins, Joe McDonald, Kevin Truong, Michael Hoppe, Nick Dean, and Patrick Pang had the idea of a soft robotic suit that corrects people’s posture. The final presentation was from Sid Iyer of EnvivoMed. His idea was creating a painless blood extraction device. At the conclusion of the presentations, the judges gathered to determine the winners of 1st, 2nd, and 3rd place, as well as the top biomedical device prize and People’s Choice award. Thank you to everyone who made this event possible, and to the teams and judges. Job well done by everyone! 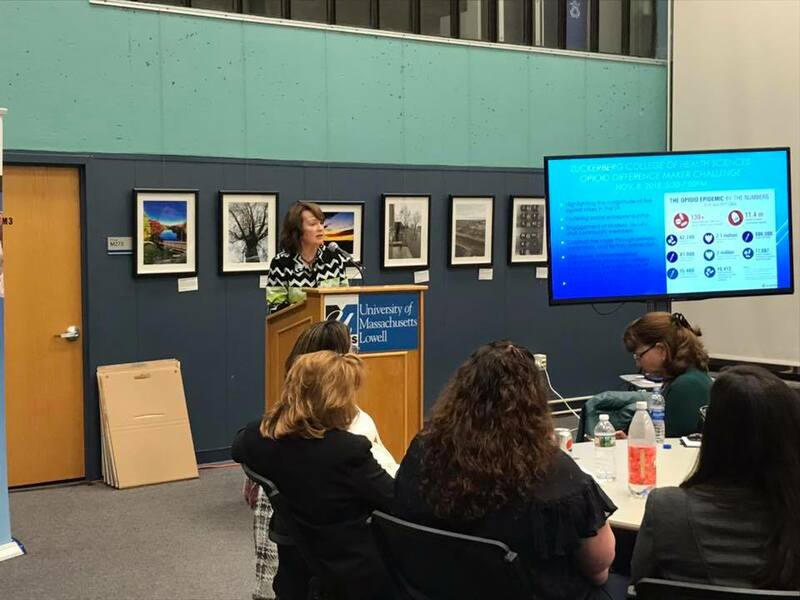 Last Wednesday, December 5th, the FAHSS Creative Venture Competition was held at O’Leary Library on South Campus. Six teams pitched their creative and innovative ideas to a panel of two alumni judges. 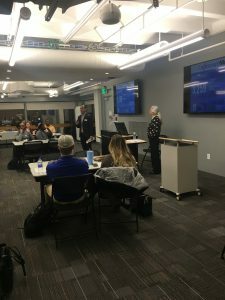 The panel consisted of Keith Neal, Class of ’93 and Glenn Morgan, Class of ’86, both alumni from the College of Fine Arts, Humanities, and Social Sciences. To begin the night, Luis Falcone, Dean of the College of Fine Arts, Humanities, and Social Sciences, introduced the judges, and thanked everyone who made the event possible. He then gave a brief overview of the format of the competition, and then the presentations ensued. Frank Talty, Assistant Dean, emceed the competition. The first team to pitch was A New Look at Life Coaching. 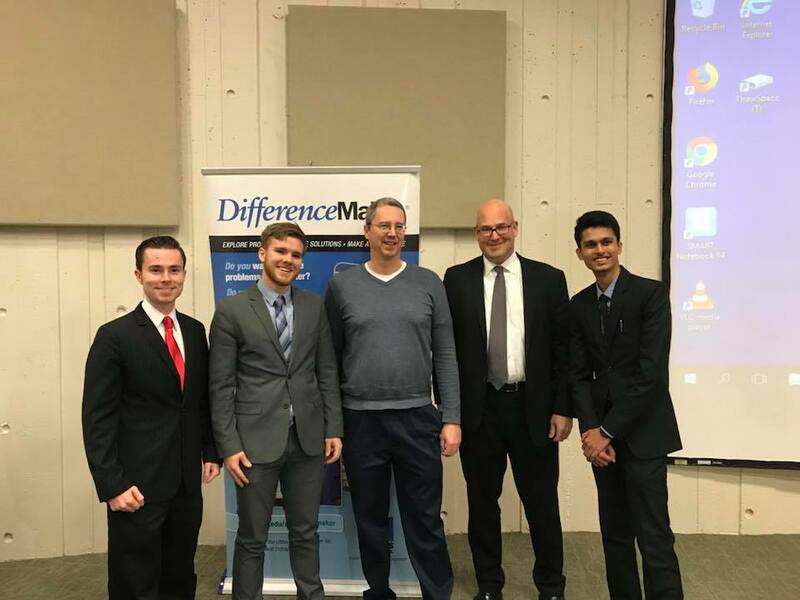 This team, led by Jack Travis and consisting of Josiah Gennell, and Nisarg Jhaveri, pitched their idea to help those affected by mental illness overcome the personal and financial barriers to recovery, wellness, happiness, and fulfilment in life. 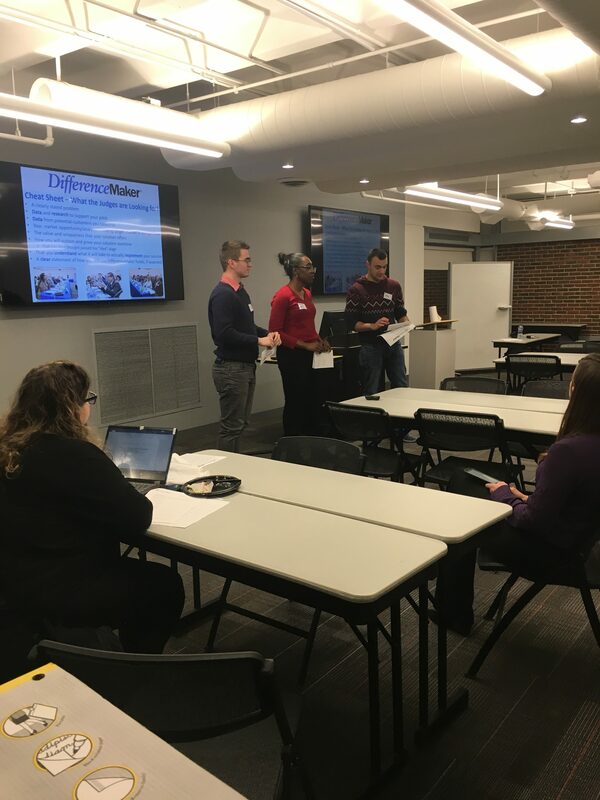 The second group to present was Voter Engagement App, consisting of Emily Yormak, Brendan Clarke, Justin St Louis, and Yonatan Tsivkin. 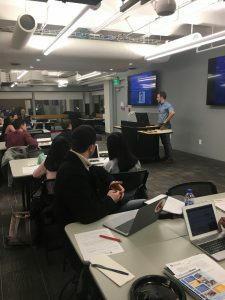 This team’s goal is to create an app with absolutely no political agenda that keeps people posted on politics, so voters can be more knowledgeable and less biased. The next team to take the stage was Juan Boungou, and Anastasia Forcucci of Innovate Lowell. This group sought to address the lack of opportunity for underprivileged children to learn business skills by implementing them into after-school programs. Innovate Lowell was followed by Benji Ball, presented by Benjamin McEvoy. His idea was a game similar to wiffle ball that took the baserunning out of it, to cater to children with disabilities. The next team up was Air Align. 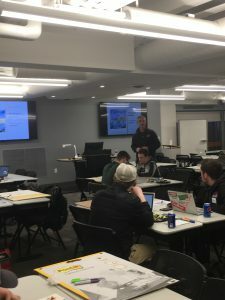 The team consisted of Daniel Gurfinkel, Alex Barr, Dennon Audette, Frederick Higgins, Alex Infantino, Joe McDonald, Kevin Truong, Michael Hoppe, Nick Dean, and Patrick Pang. This team is creating a soft robotic suit that corrects peoples bad posture habits. The final team to present was Magnetic Textbooks. This team consisted of Jasmine Bell, Conrad Nelson, and John Lesack and aims to prevent students from having to lug multiple large textbooks to school every day. Their product is a magnetic textbook that students can insert and remove sections of different books, based on what material they will need on that particular day. After deliberation, the judges selected Benji Ball as the grand prize winner, winning $5,000! There were many great ideas pitched and we all look forward to seeing the progression of each project. A big thank you to the judges for their time, sponsorship and effort, and to everyone who came out and made this night a great success! 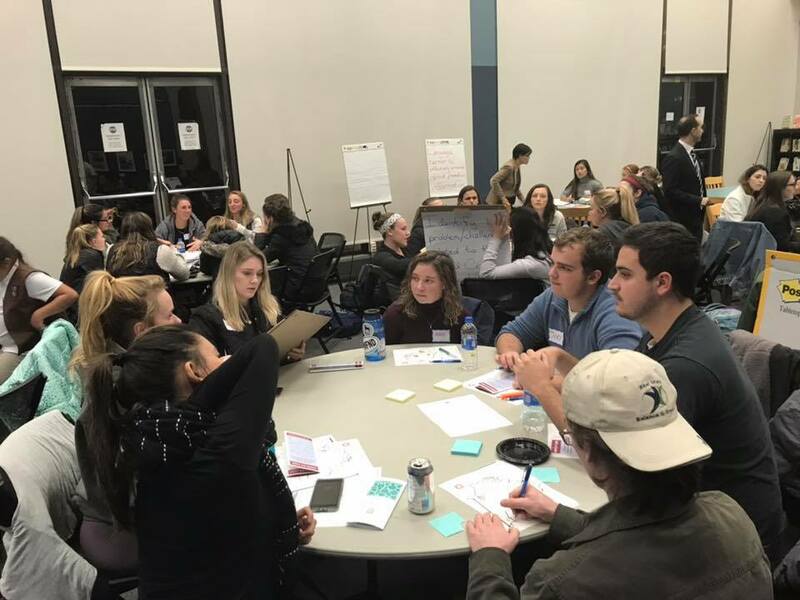 On Tuesday, December 4th, the DCU/Manning School of Business Innovation Contest was held in Moloney Hall at UCrossing from 6 to 9PM. Six teams competed with their innovative banking and finance ideas. Each team left with $100 per team member as a cash prize and the winning team received an additional $500 per team member. The event began with food and networking. Once the audience was settled in, Sandra Richtermeyer, Dean of the Manning School of Business opened the event by thanking everyone who put in hard work to make this all come together. 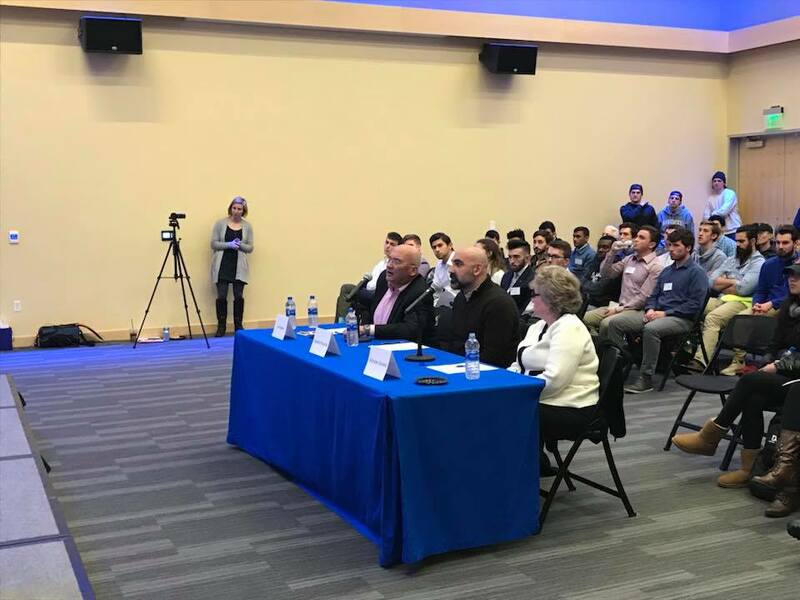 She then introduced the judges; Jim Regan, President & CEO of DCU, Michelle Silveira, Senior VP & CMO of Jeanne D’Arc Credit Union, and Vasilios Roussos, Managing Director at Fintech Innovation Center. Once the judges were introduced, the team pitches ensued. The first team to go was Asset Tracker. Their team consisted of Chris Bradley, Michael Gergley, Jared Girourd, Zachary Palmer, and Michael Rivers. 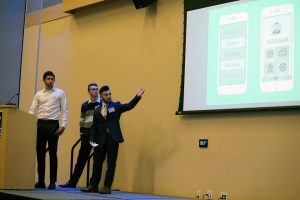 The team pitched their idea of an integrative finance app that can keep track of all of the user’s accounts and assets in one place. The judges listen in to the first pitch of the night. The next group was ATM fast App by John Lesack, and Conrad Nelson. This duo pitched an app that can improve your ATM experience easier by making the majority of your transaction remotely before using an ATM, while maintaining the utmost security. Next to the stage was Chip Away, consisting of William Hanna, George Le (2018 Idea Challenge winner), Peter Maitland, and Hannah Wright. Their idea, Chip Away, was a creative solution to helping people pay off student debt. Finance 4 Life was the next team up. Members included Brett Battaglia, Brian Conneely, and Stephen Sarrouf. Their idea was an interactive Finance app targeted for High School and College students that taught Finance in a fun way. Finance 4 Life was followed by another team with a Finance app; Proactive Student. Siddhant Iyer, and Sourabh Kulkarni demonstrated how their app would work and fielded questions from the panel of judges. The last team to pitch was Universal Cash Deposit ATM. This team consisting of Keegan LaPierre and Aidan Kilgannon pitched their idea of innovative ATM software to make depositing cash anywhere easier. At the conclusion of the presentations, the judges exited the room to deliberate, then returned to announce their decision. The winning group was Chip Away! The team won a total of $2,400 in cash prizes. In total, DCU awarded $3,800 to the teams at the competition. Thank you to the judges, teams, attendees, DCU and the Manning School of Business. We can’t wait to see how these innovative ideas develop!